More experts have weighed on the death of 17-year-old gorilla, Harambe, after it was shot when a 3-year-old child fell inside his cage last week. What else might have been tried? 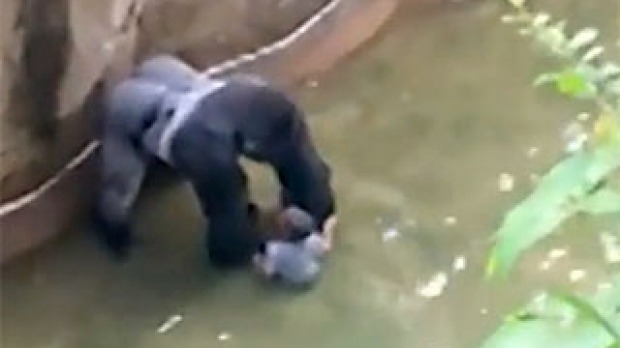 I agree with the zoo director who felt a tranquilliser dart gun, which delivers a painful jab in the behind, could have startled Harambe and in the time it would take to have an effect, might have put the child at greater risk. Gorillas have a reasoning mind, however, and if someone known and trusted by Harambe had tried to calm him, perhaps offering something that would immediately attract his attention such as a tray of his favourite fruits, a negotiated settlement might have been possible (all the while with the marksman in position to shoot if necessary). Perhaps this was tried, but there has been no mention of it. Aside from the wider ethical issues of keeping apes (or indeed any self-aware, nonhuman beings such as elephants and dolphins) in captivity, this tragic incident raises two key questions. How is it possible – yet again – for a child to gain such easy access to any zoo enclosure? Especially when zoos are primarily a family attraction. Even if no gorillas were involved, surely public safety standards require that a child cannot get to a 15ft drop so easily. And second, will zoo professionals amend their emergency protocols to try non-lethal methods first, with a marksman ready to shoot but only in the event that lethal force is necessary? Then such tragic events might be avoided in the future. Cincinnati Zoo director Thane Maynard defended the zoo’s move, saying the exhibit was safe. The boy’s fall into the pit was a first in the zoo’s decades-long existence. “We did not take the shooting of Harambe lightly, but that child’s life was in danger. And people who question that, or are Monday morning quarter backs, or second guessers ,don’t understand that you can’t take a chance with a silver back gorilla. They’re three times bigger than a man, six times stronger. It’s a dangerous animal…We’re talking about an animal that I’ve seen with one hand, take a coconut and crush it,” he told reporters. Meanwhile, witnesses to the incident said the gorilla was dragging the child around. Kim O’Connor, who recorded the viral video, said there were parts of the incident too horrific to show. “I follow the gorilla down to the moat, I watch him drag the boy up to the top of the moat in the concrete exhibit area. After that he literally treats this small boy like a rag doll. This is not on video. I would never show it, it was that horrific,” she told WKRN. She said the crowd was agitating Harambe. “If he saw people, he would spook. And he’d drag him more,” she explained. “The crowd itself just kept going crazy, making him more agitated. At one point I honestly thought he was going to throw that kid back at us. But he stayed with him,” she added.